How Japanese was Cottage Row? 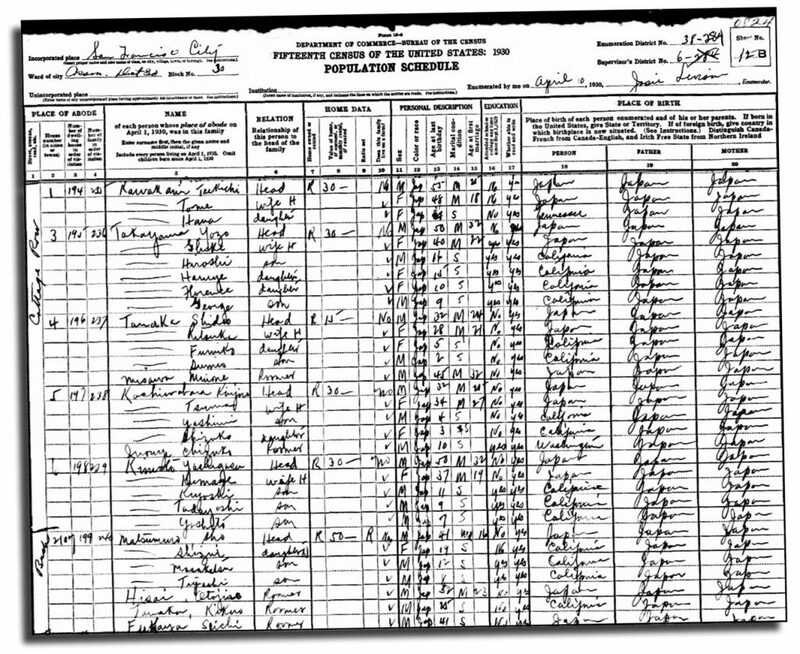 The 1930 U.S. Census shows Cottage Row occupied by Japanese-Americans. SOME NEIGHBORHOOD CRITICS of a plan to create a memorial Zen rock garden on the Sutter Street side of Cottage Row have disputed historical sources that say Cottage Row was primarily occupied by Japanese-Americans before they were evacuated and interned during World War II. A review of census records and city directories shows that Cottage Row was almost exclusively occupied by residents of Japanese descent from 1920 until they were incarcerated in 1942. The 1920 U.S. Census shows that five of the six cottages had residents with Japanese surnames. That was still the case when the 1930 census was taken. The San Francisco Street Directory listings of Pacific Telephone Co. from 1933, 1936 and 1940 confirm the overwhelming Japanese presence on Cottage Row. “The six cottages were almost exclusively Japanese,” said architectural historian Bridget Maley, who retrieved and reviewed the census records and city directories from the pre-war era. “There are also lots of Japanese names in the adjacent blocks of Sutter, Webster and Bush,” Maley said.